Kiyomi Sakamoto sadly passed away earlier this year. We will display a sampling of her quilting, fibre art and a few pieces of clothing which her family and friend have generously loaned to us. “The Betweens” – This small quilt group was formed out of the Community Quilts around 10 years ago. All 12 members belonged to YHQG and enjoyed working together on Community Quilts. Two members have moved away (Jill and Ann), but still attend when they are able. Another two original members have passed on (Meg Gordon and Willie Smee) and are greatly missed. 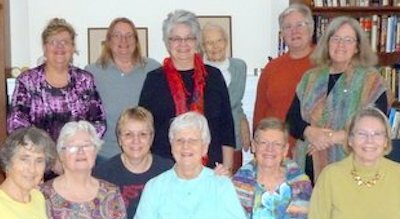 This group is a lasting tribute to the value of friendship and a mutual love of quilting. Front row from left: Cora Westgate, Val Taylor, Anne-Louise Lanteigne, Helen Crooke, Willie Smee, Noreen Deeley. Back row from left: Janet Heise, Erica Ribiero, Jill Leslie, Meg Gordon, Marion Boucher, and Ann Sutherland. Quilts of Valour – we are very pleased to welcome this group to our show to thank them for the work they do for our veterans and to help promote their organization. It is especially fitting as we will be celebrating Remembrance Day at 11:00 am on Saturday, November 11 with taps followed by two minutes of silence.